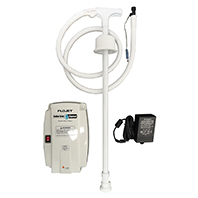 The Flojet Bottle Pump is designed to pump water from commercially available 3, 5 or 6 gallon water bottles. The system delivers the bottled water under pressure to your Keurig K-Cup brewer. At just 5.6 lbs, the The Flojet Bottle Pump is the most compact system you can buy and it’s the most affordable. Amp Draw- 115 Volt 0.5 Amps. Max.